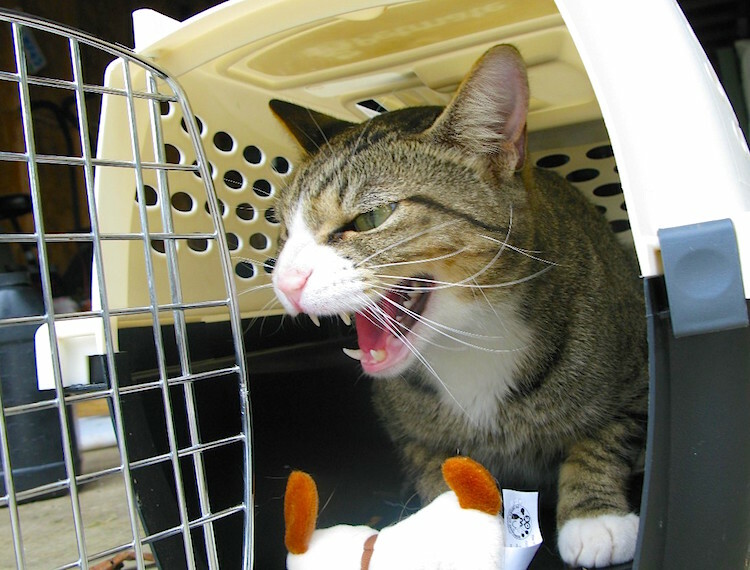 If a trip with your cat starts with an all-out battle, read these tips for getting your cat in a carrier without getting injured. It is almost the worst part about taking your cat to the vet — the moment you realize you have to actually get him into the carrier for his safe transport. Often it involves a massive chase through the house and at least 1 item is broken, your cat screaming as though he is being murdered, and you are subjected to several swipes that leave you in need of a 911 call — or at least several Band-Aids. Cats seem to universally have a hard time with going into the carrier, and who can blame them really? It’s essentially a small box that is usually pretty dark and hinders a cat’s ability to protect itself. Now, I have a vested interest in this topic as my cat, Harrison, considers a trip inside the carrier tantamount to a declaration of war, and I would love to avoid bloodshed the next time I have to bring it out. With that in mind, here are some helpful tips to get your cat in a carrier. First, take good care of your carrier as well as your cat. Keep it clean. If there have been accidents in it before, it will smell bad. Would you want to go into a little box that smells like pee (or worse)? Neither will your kitty! If you have to store the carrier someplace out of the way like the basement, attic or shed, clean it and air it out a day or so before you need to use it. Although a fresh-smelling carrier isn’t necessarily going to entice your feline, he’ll probably fight even harder if it smells bad. Make sure there are no areas inside the carrier that are worn or sharp that could possibly cause injury. Most carriers are made of strong plastic but after a long time and lots of angry scratching from your cat, this plastic can wear down. Also, check the door to make sure it is latching properly. Imagine finally getting your kitty inside the carrier only to see him bat the door open and escape. Now you have to get him inside it again — and this time, he’ll be on to you. Save yourself the trouble and check first. Make sure it is as comfortable as you can make it. An old towel to soften things up works wonders, especially if your cat is going to have to be inside the carrier for some time. Again, check to make sure that there are no worn areas that could cause injury. It is not a good idea to wave the carrier around shortly before you are planning to put your cat into it. If he sees the carrier, chances are he is going to disappear on you, and then you will spend time hunting him down before you even begin the fight to get him inside the thing. Keep the carrier out of sight if possible. If that’s not a possibility, don’t let your cat see you pick it up or move it about. Just set it down and wander off for a few hours so he gets accustomed to seeing it there. When it is time to leave, approach him gently. Don’t come charging at him and snag him by the scruff — you’ll only scare him and reinforce the idea that the carrier is bad. Pick him up, speak gently and try to back up toward the carrier so that it is not in his line of sight. Cats are smart so he may catch on, but this has worked for me with Harrison before. Some cats can’t get enough treats. If you have a laid-back cat who loves his kitty treats, leaving some in the carrier may work for you. If you’re lucky, he’ll smell them and zoom right in. Then, while he’s munching, you can neatly latch the door behind him. This does seem to be too good to be true, and I admit Harrison is always onto me when I try it. I usually get a look that says “get real” and then he vanishes. You may have more luck than I did, though. It is a non-scary way to have your cat enter the carrier, and it has the added benefit of being low-stress for both you and your cat. When it is time to actually get your cat into the carrier, remember to take your time. It’s frustrating for you and scary for him. If you are at floor level, back him in gently but firmly and keep your hand in front of him so he can’t make a run for it. Speak in a soothing manner. If you get stressed, he will too — and then the whole experience will be even rougher for you both. If he is amenable once inside, you can slip him a treat through the door or the side bars to try and make him happy. If your cat is a fighter, and many are, the trick is to be as gentle as possible. If you absolutely must use the scruff-of-the-neck method, make it quick and as gentle as possible. Turn the carrier on its side and lower him in, and let go as soon as you can. He won’t be happy, but he won’t be hurt either. Remember that the more traumatic the experience is, the more difficult it is going to be each time he needs to go into the carrier. Once your kitty is in his carrier, please remember that he is actually in there. Some cats like to see out, while others may be scared. If your cat is afraid, it can help to cover the carrier with a towel so he is not suddenly exposed to strange sights. When picking up the carrier, do it as evenly as possible. Don’t bash into walls with it, and don’t use it to prop open doors. If you drop the carrier or wave it around, he could get hurt, and that is the last thing you want. The purpose of the carrier is to keep him safe, right? The trick to the carrier is to really just be careful, take your time, and pay attention to your cat and his comfort zones. Some cats adapt to the carrier beautifully, but many more struggle with the whole concept — and will continue to do so their entire 9 lives. It is up to us as caretakers to work with our cats to ensure the safest and smoothest transition possible. Getting your cat in a carrier is never going to be the easiest and most fun experience, but with patience you will be able to do so without harming him — or needing to run for the first-aid kit!